I originally posted this in early 2015. I also shared it as part of a multi-part case study on building a Community of Practice in maintenance and engineering at CCA. Four years on my practical application of social learning and all that I learned about effectively enabling it remains relevant, which is why I'm sharing it in my September 2018 newsletter. For several years I set up and led an Academy in Supply Chain at Coca-Cola Amatil (CCA). One of the most important things I learned in my time with CCA was how to effectively use social learning to add strategic value to an organisation. In October 2014 I spoke at the Learning At Work conference held in Sydney, Australia about my development as a social learning practitioner, and how this impacted the application of social learning in my business unit. If you want to harness the power of social learning more intentionally and effectively this case study about the evolution of how I got strategic with social learning will give you ideas and pointers. I am now available to work with your organisation to develop and implement effective approaches to help your people to connect with others inside and outside your organisation who have common interests, challenges and opportunities. This enables them them to solve problems, improve processes and innovate together creating a high performance environment and impacting business results. Contact me at michelle@michelleockers.com or call me on +61 404 899 532. My reflection as I prepared to present at the conference and how this triggered an insight that shifted how I was using social learning. When I was approached to speak at this conference an organiser asked me to describe what I was doing that may be of interest to the audience. She then wrote a session description and gave it a title. Unusually, this was not sent to me for review before the conference brochure was published. I was surprised by the session title that she chose - "Sneaking In The Social." Gosh, I thought I was experimenting and role modelling! Reflecting on the title and preparing this presentation was a turning point - it was time to move from 'sneaking' to 'enabling'. It was two months before the conference, and I wanted something useful to share. 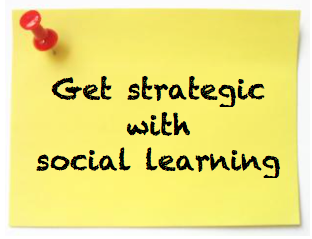 I decided to get strategic with social learning. CCA adopted the 702010 framework at least four years ago, however we had applied social learning in a limited fashion in the context of this framework. In April 2014 we added 'continuous workplace learning' as an explicit element of our Supply Chain Capability strategy which expanded the endorsed role of our Capability team beyond structured learning programs to supporting informal learning. In September 2014 we defined a specific social learning initiative to contribute to a high priority initiative in our business unit strategy. This was the point at which we moved from experimenting with social learning to enabling it. This entry was posted on January 24, 2015, 5:01 pm and is filed under 702010, Community, SLPP, Social Learning. You can follow any responses to this entry through RSS 2.0. You can leave a response, or trackback from your own site. Thanks for this post Michelle – I was curious about your preso at this conference which I didn’t get to, so great to get some insight on what you covered here. Fave takeaway: managing change is “mostly about relationships and behaviours”. Great perspective and approach to ‘change management’. Thanks for your feedback Tanya. On 17 Feb (2015) I will be presenting a slightly different perspective on our Working Out Loud experience in Supply Chain at Coca-Cola Amatil. It’s a 15 minute case study (so will be punchy) at the end of Simin Terry’s opening keynote on Working Out Loud. Shall share this on my blog too.